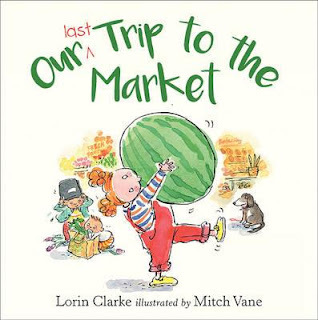 Our Last Trip to the Market is Lorin Clarke’s first children’s picture book. She has written a delightful, funny and entertaining story about a mother and her six children going shopping at the fresh food markets. It is busy market with a vibrant atmosphere. In the air is the scent of coffee, nuts, doughnuts and flowers. Mum needs to visit the deli, the bakery, the florist and the fruit and vegetable shop. The illustrations show that it is inevitable that some of the children will create a bit of mischief during this shopping expedition. What will some of the children get up to? ‘Annabelle, please put that down.’ Will Mum be able to keep everyone together? ‘What happened to Annabelle?’ How will the market sellers feel by the time this family has left their shop? Once the shopping is done the story makes a great transition getting the family back into the car. Mitch Vane has illustrated this in a pleasing double page spread of the children stomping though the carpark. Lorin Clarke has created a mother that can keep her cool with her ruckus bunch. Clarke keeps the story moving at a good pace and uses gentle humour that children will enjoy. Mitch Vane’s illustrations masterfully add to the storyline with the illustrations showing facial expressions and body language to depict the playful children and the annoyed market sellers. This is a story that will be read aloud often. Please set aside some time to look at the detailed busy market illustrations.